Abstract: How can leaders recover public trust and approval when government performance is low? We argue politicians use speeches evoking images of deceased predecessors to reactive support temporarily. This arouses empathy and nostalgia among supporters, causing them to perceive the current leader more favorably. We test this argument by scraping for all speeches by Argentine president Cristina Fernández de Kirchner. We identify all instances when she referenced Juan Perón – the charismatic founder of the Justice Party. We find that as Kirchner’s approval rating decreases, the number of Perón references increases. To identify the causal mechanism and to ensure that endogeneity is not a concern, we employ text analysis and a natural experiment – courtesy of LAPOP. The results provide robust evidence that leaders reference their dead predecessors to evoke positive feelings. However, while doing so can improve public opinion, the effects manifest only in the short-term and among supporters. 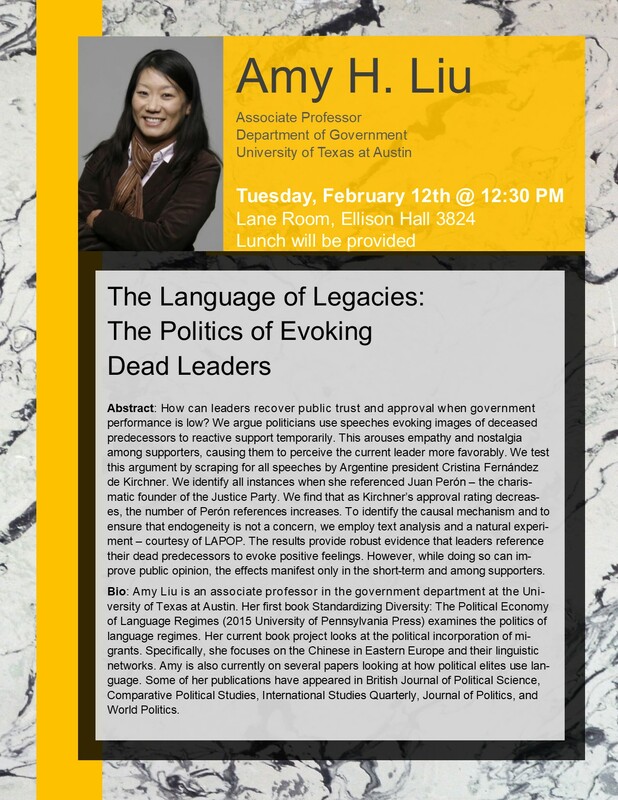 Bio: Amy Liu is an associate professor in the government department at the University of Texas at Austin. Her first book Standardizing Diversity: The Political Economy of Language Regimes (2015 University of Pennsylvania Press) examines the politics of language regimes. Her current book project looks at the political incorporation of migrants. Specifically, she focuses on the Chinese in Eastern Europe and their linguistic networks. Amy is also currently on several papers looking at how political elites use language. Some of her publications have appeared in British Journal of Political Science, Comparative Political Studies, International Studies Quarterly, Journal of Politics, and World Politics.